a curatorial project and art space. 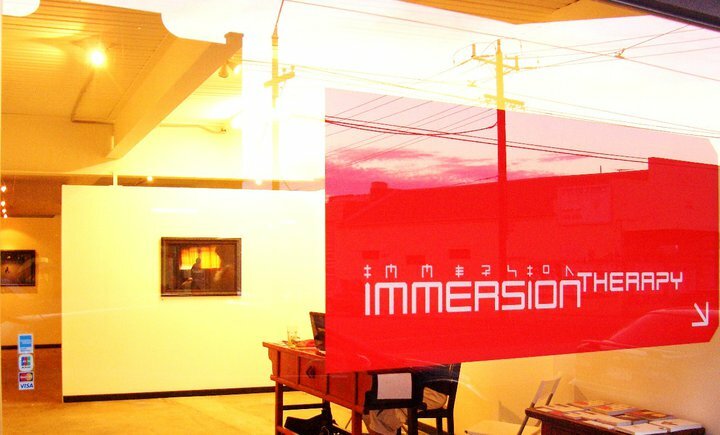 Immersion Therapy was a curatorial project and art space created by Dave Di Vito. From 2008 - 2009, Immersion Therapy curated and hosted 12 artistic exhibitions at its venue in Northcote, Melbourne. Dozens of artists participated in exhibitions and events at the site. Dave Di Vito opened Immersion Therapy in 2008. Having graduated with a Masters in Art Curatorship from the University of Melbourne in 2007, he set about planning and executing a curated program that featured a variety of established and up and coming artists. In collaboration with the dozens of artists involved, an underlying multicultural theme emerged. Artists from across Asia and Australia were encouraged to exhibit and collaborate across shared exhibit spaces. Logo design and that of the promotional material were created by Shane Hearn. For images and information for all twelve exhibits click below on " See curated projects"
A non profit model, similar to that of an ARI (Artist Run Initiative) was used to ensure that the bulk of sale proceeds benefited artists rather than the artspace itself.